Back in February when we started this blog the first blog post introduced the expressions for how to greet someone and say “hello” in Dieri. Basically, what we say is wardaru ‘how’ plus the relevant pronoun yini ‘you (one person)’, yula ‘you (two people)’ or yura ‘you (more than two people)’. Interestingly, since then Dieri people are increasingly using these expressions in conversation when they meet, and also in emails. So, how do we start and continue the conversation? In Australian English, we might say ‘g’day, how are you going?’. What about in Dieri? In English it might seem rude to ask someone who you have just met: ‘Where are you going?’ (unless they are a good friend) but in Dieri this is quite normal. Notice the ending -lha added to wapayi to indicate new information about something happening now. 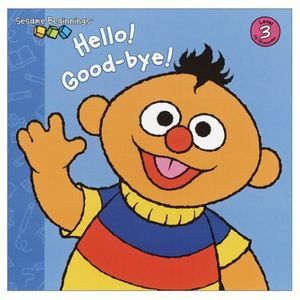 Again, this might seem a little odd to speakers of English but different societies have different ways of greeting each other and saying goodbye and this just happens to be the Dieri way. Speaker A: mayi, wardaru yula? Speaker A: wirdirdi yula wapayi? Speaker A: Hey, how are you two? Speaker A: Where are you two going? Speaker A: Go that way. 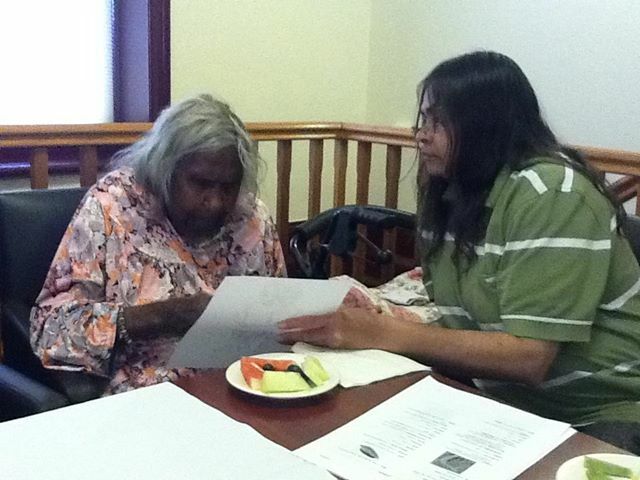 Following the two-day Dieri ILS revitalisation workshop the Dieri Language Committee met for one and a half days to check over the draft Dieri-English dictonary, and to make recordings for the planned Dieri talking dictionary. We approached this by describing a set of pictures drawn by a Pitjantjatjara artist and made available to the group by Greg Wilson. Each language committee member took turns in describing some aspect of the pictures, making up Dieri sentences that they felt said something about what they saw in the drawings. Three generations of speakers were present, and everyone contributed according to their knowledge and abilities. The result was a nice selection of more and less complex constructions that will be excellent source materials for future Dieri language learners. 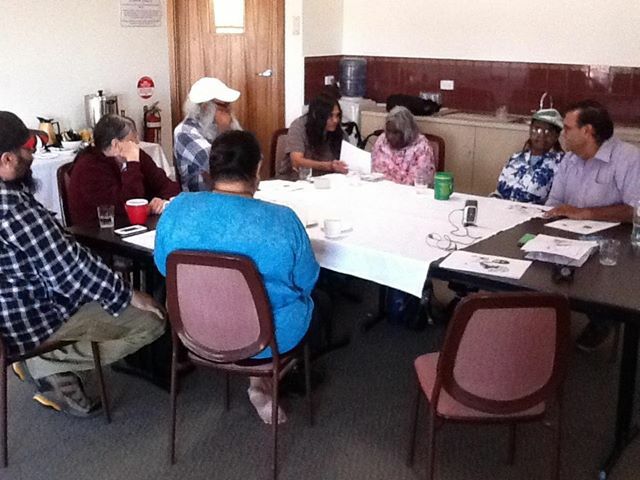 The group enjoyed the process and the opportunity to share their knowledge, especially when Aunty Winnie kept making jokes that got us all laughing. We even got some new words that were missing from the dictionary (and some example sentences that were a bit too rude to be included). Note: the title of this blog post means “What is this here in the picture?” and uses a word borrowed from English pitya ‘picture’. You should be able to work out the rest of the sentence and its grammar from previous blog posts. 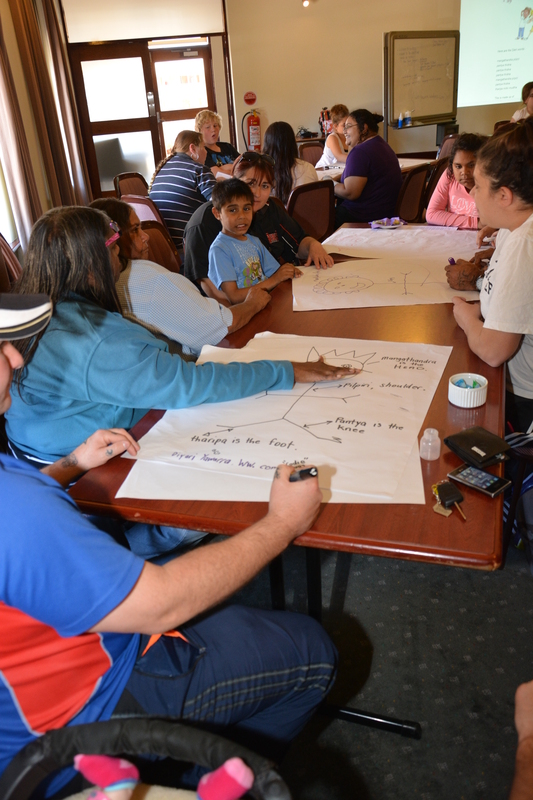 The Dieri Aboriginal Corporation organised a final language workshop for the ILS language revitalisation project on 1st and 2nd September. On Sunday, 55 community members participated, and on Monday there were 35 enthusiastic participants — on both days ages ranged from 6 months to 82 years, so there was quite an age range! Community members came from Port Augusta, Maree and Broken Hill. There was also a representative of the Parnkalla community who welcomed us to Port Augusta — Aunty Rene and Uncle Reg responded in Dieri to the welcome. Peter Austin flew out from London (via Brunei, Singapore and Sydney) and Greg Wilson took part on Sunday, driving the 7 hours Adelaide-Port Augusta-Adelaide within less than 24 hours. The goal of this workshop was to practise language use, and also to try out the draft Dieri-English dictionary. We ran various activities, including using the dictionary to look up words so we could make up Dieri sentences describing some pictures, making sure the words were in the right Dieri order and had the proper endings, like the marker for the transitive subject that has been discussed in previous blogs. 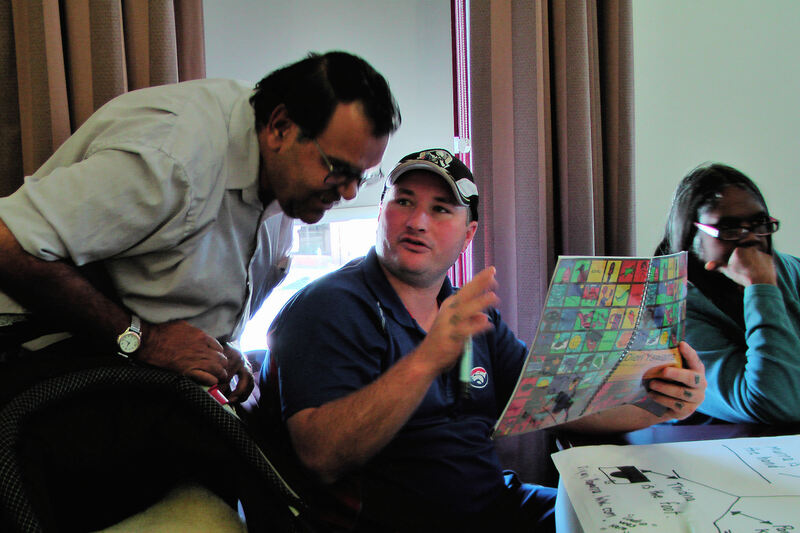 Everyone enthusiastically joined in the group activities, and there was a lot of use of the draft dictionary and the Dieri language materials that Greg Wilson and the Dieri Langiage Committee produced a couple of years ago. The only thing missing was a guitar player so we could properly song Dieri songs! 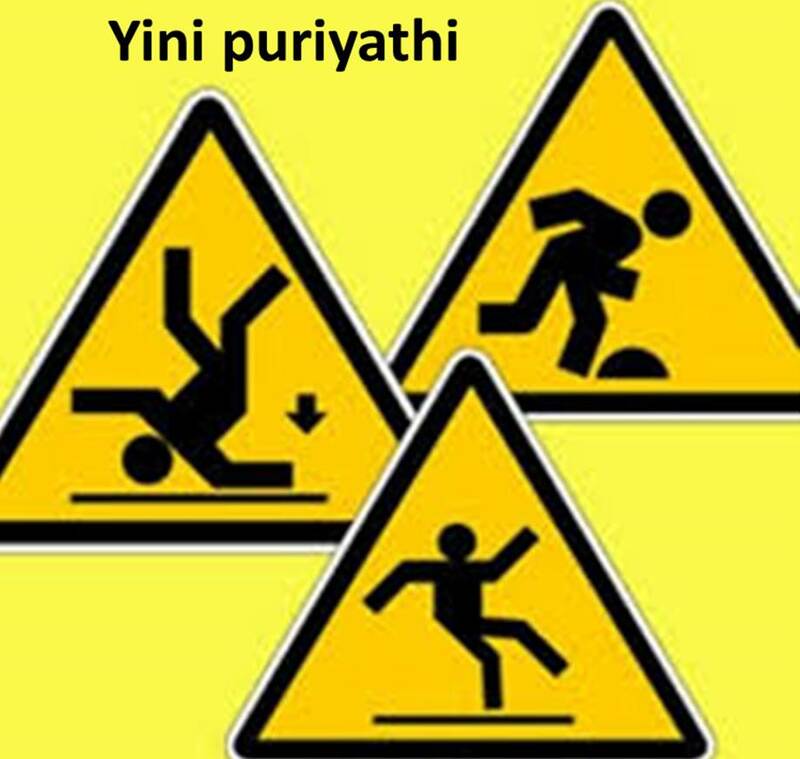 which consists of nhulu ‘he, this’, the transitive subject, kinthalali ‘dog’, also the transitive subject (indicated by the ending -li), yinanha ‘you (one), the transitive object, and mathayathi which is made up of the verb root matha ‘bite’ and the ending -yathi. this is: ngapuriyamayi ‘be quiet!’, made up of ngapu ‘silence, quiet’, -ri ‘become’, -ya ‘command’, -mayi ’emphasis’, ngathu ‘I’, transitive subject, yinha ‘you’ transitive object, and nandrayathi ‘might hit’. Did you try the challenge at the end of the previous blog post? Did you try to translate into English the Dieri title nhawu dalkiyi nhungkarni ngandrinhi? 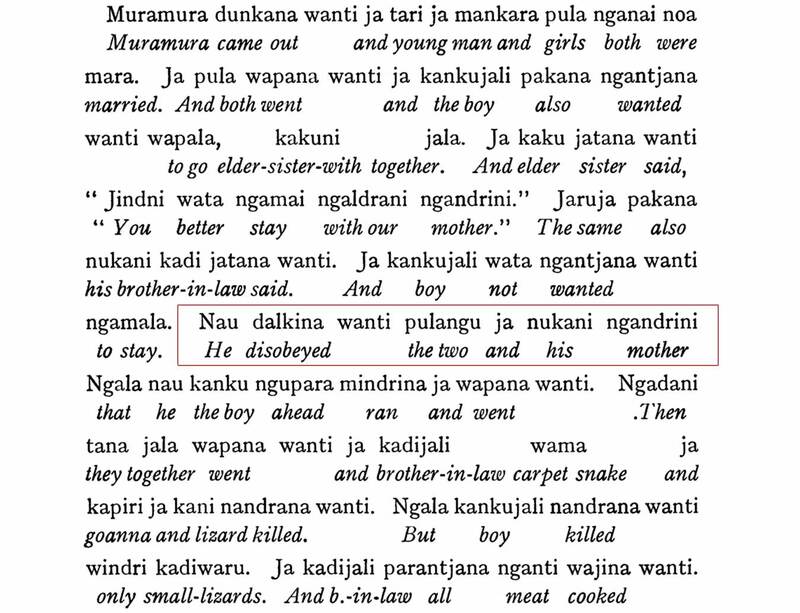 ngandrinhi ‘with/at mother’ consists of the root ngandri ‘mother’ and the locative ending -nhi ‘with, at’ which marks the second participant of an extended intransitive verb. The main character in the story is a boy, who is told by his older sister (kaku) and brother-in-law (kardi) to stay at home with his mother (ngandri) while they go off somewhere else. He disobeyed them and his mother, and followed along behind his older sister and her husband. Various adventures follow, including the boy being told to climb a tree which is then magically sung by the brother-in-law so that it grows and grows and the boy is trapped high up at the top. 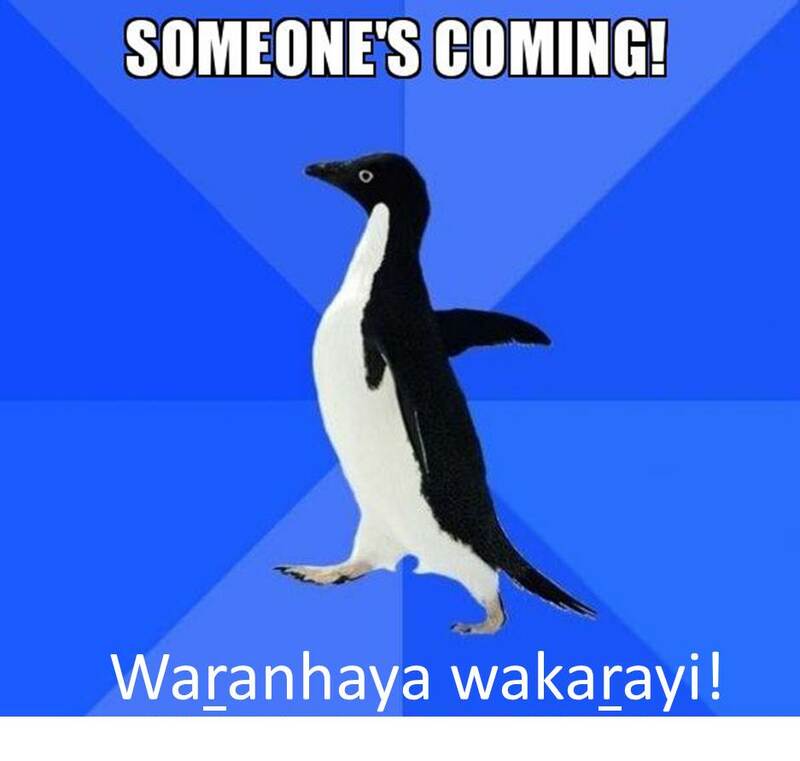 He is eventually rescued by his two older brothers (nhiyiwurlu); one of them is left-handed (ngunyari) and the other is right-handed (warrangantyu). Eventually, the three brothers catch up to the evil brother-in-law and finish him off. Fry published a number of Dieri traditional stories from Dintibana in two issues of the journal. The only one Peter Austin was able to check with Dieri speakers in the 1970s was this one. Fry, H. K. 1937. Dieri Legends, Part II. Folklore, Vol. 48, No. 3, pp. 269-287. The Dieri language makes a fundamental distinction between verbs (words describing actions or events) that are intransitive and verbs that are transitive (see this blog post for an introduction). When we learn a new verb in Dieri it is important to also learn whether it is intransitive, transitive or extended intransitive as this will affect the number and form of the participants that can occur together with the verb. Question: Can you translate the title of this blog post? The sentence actually comes from a traditional Dieri story. The answer will be in the next blog post.